Contact us in any of our offices located at the following addresses. A good Caltec Score® increases the possibility to get credit approval to acquire what you need. The Predictive Caltec Score® has a scale that goes from a minimum of 150 points, the worst point total, to a maximum of 950 points, the best. Predictive Caltec Score® is intended to predict the behavior, from the standpoint of risk, over the next 12 or 24 months, of any person applying for credit. Predictive Caltec Score® has been developed based on precise mathematical and statistical models, including the most advanced and sophisticated logistical regression techniques. Use the Predictive Caltec Score® to implement a credit evaluation policy that is fast, consistent, and objective, and allows you to precisely measure the credit risk of your prospects and clients, in order to establish the Cutoff Score that allows you to maximize your benefits and minimize the economic losses associated with your productive activity. Don't gamble with your investment. Measure the credit risk of your prospects and clients with precision. "A methodology based on probabilistic, mathematical, and economic type models, that try to measure a series of variables and data in order to obtain valuable information about the making of credit decisions, applying statistical actuarial evaluations by means of specialized computer programs for retrospective analysis and inferential tendency." 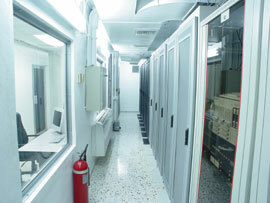 Data-Crédito´s New Data Processing Center. variation in risk so that you can take preventative and protection measures that you consider pertinent, quickly, and at your discretion. 2. To conveniently make strategic business decisions in order to increase your sales on credit. The Law Regulating Credit Information Businesses and Information Owner Protection, known as Law Number 288-05, was promulgated by the President of the Dominican Republic on August 18th, 2005. Law 288-05 establishes the legal framework to regulate Credit Bureaus, guarantee respect for the privacy of individuals, and promote truth, accuracy, effective updating, and the proper use of information in the Dominican marketplace, in order to minimize credit risk in this country. Reports that require the Individual´s permissionIt is very important that our affiliates and authorized users be aware that article 14 of Law 288-05 states that before applying for and obtaining a Credit Report, it is mandatory to obtain the individual´s express written permission, which must indicate that the owner of the information authorizes the fact that his information can be consulted in the BIC databases. Reports that do NOT require permission by an Individual Articles 37 and 38 of Law 288-05 establish exceptions to this requirement to obtain permission, it being clearly stipulated that the owner´s permission is not required in order to obtain a Credit Score Report, an Insurance Report, a Corporate Credit Report, or a Public Information Report, Report for purposes of Collection, and other types of reports for marketing purposes. Legal Procedure for Correction of Errors Law 288-05 introduces the Procedure for Claim of Modification, Correction, and Cancellation of the Owner´s Information, so that consumers who are not in agreement with the information contained in a report coming from a BIC can formally present a claim to invoke the right to modification and cancellation of the information which they deem illegal, incorrect, erroneous, or out of date.